To understand the process of galvanizing, it is first necessary to know that there is more than one way to achieve galvanized metal. Galvanization is a process of chemically, electrically or mechanically bonding zinc to a underlayer of metal - typically steel or iron. The type of galvanization process determines the durability of the metal, its resistance to corrosion, how the metal will function indoors and out, and what the finished texture looks like. 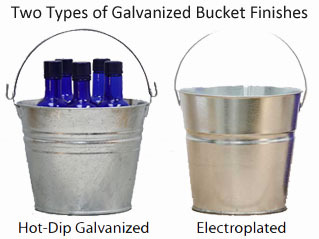 Chart 1 below compares properties of two types of galvanization: hot-dipped and electro-galvanizing; the two types of methods used on our products. Unmatched damage protection from rowdy handling and environmental corrosion is due to bond strength, hardness, and malleability of hot-dip galvanized metal. Hot-dip galvanized steel provides more than just barrier protection: Even in the event that the impermeable zinc coating is damaged, it will provide sacrificial cathodic protection to the exposed steel. Exposed steel up to 1/4" is protected from rust by the surrounding zinc (8). Want more details? Learn the industry method of making hot-dipped galvanized steel or jump below to read electro-galvanizing process details. Is hot dipped galvanized the same as galvanized? 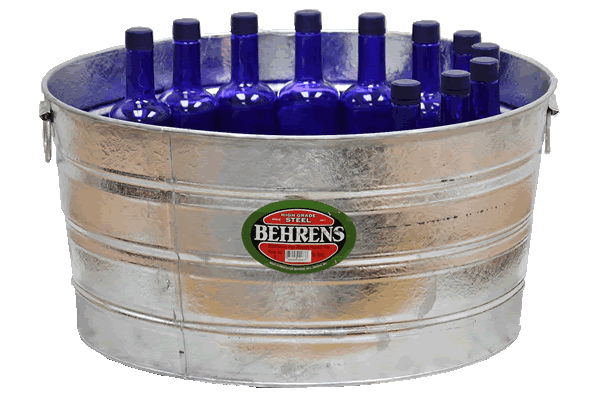 Hot dipped galvanizing is the oldest and most popular type of galvanization process. However as just discussed, metals can be galvanized in more than one way. When clean steel is dipped into molten zinc - as in hot-dipped galvanizing - a unique coating develops that creates a strong bond with the steel. This protective coating is tougher and more resilient than other coatings that only bond electrically or mechanically (2). Hot dip galvanizing ensures the zinc coating applied to protect steel provides extended durability, especially outdoors. Read more about the corrosive properties of hot dipped galvanized steel: does galvanized steel rust? Since electroplated galvanized steel is softer (70 DPN) than the hot dipped counterpart, electroplated galvanized steel is more vulnerable to roughhousing, scratches, and homestead wear and tear. Electroplated galvanized steel will last just as long (if not longer) than hot-dipped steel, if it's being used to organise socks in your closet; for example. An electroplated galvanized steel bucket left outside and subjected to drops, dings, and scratches will last less than 70 years. The performance of any galvanized metal is influenced just as much by the galvanizing method as the environment it is kept it. Learn more about the environmental factors that contribute to galvanized metal deterioration over time. Electrogalvanized (electroplated) coatings are made by applying zinc to steel sheets and strips by electrodeposition. The coating thickness (figure 1) is much less than the hot dipped process but provides a smoother finish (image 1). The steel used in car bodies is galvanized using electroplate galvanizing because layers of decorative paint can be easily applied. One way zinc is electrodeposited to steel is through the immersion of steel in an electrolyte, a solution of zinc sulfate or cyanide. Pure zinc coats the surface of the iron or steel through electrolytic action. 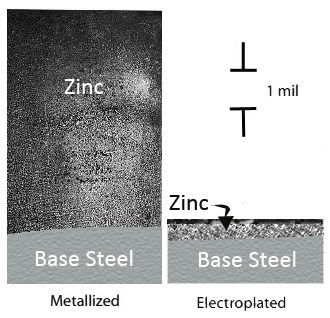 Read more about the thickness and microstructure of various zinc coatings here. If the electroplated galvanized finish is damaged or cut the steel edges under the zinc remain exposed, bare and threatened by corrosion. 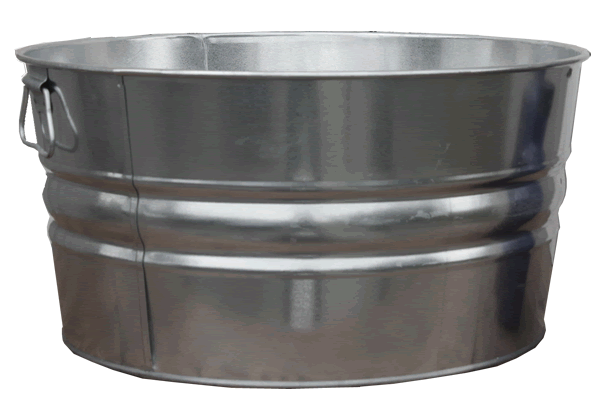 White rust or the product of zinc reacting with atmospheric oxygen and water does not occur on the smoothly finished galvanized steel buckets. Similarly, no sacrificial cathodic protection is obtained from the thin coat of electrolytic galvanizing. The thickness and consistency of the coating can be accurately controlled using this process. Best paint adhesion: the zinc layer from the hot-dip method is too thick, and causes issues with the paint adhesion. Long life with interior use only. If coating is damaged from wear and tear the steel remains bare and threatened by corrosion. Zinc coating offers no sacrificial protection like hot-dipped galvanized finish.